There was an interesting thread on Twitter last night: What is your favorite Disney movie? The Lion King was a front runner and yes, I agree that it’s a classic. I threw out The Incredibles and Up as my favorites, but Toy Story has a special place in my heart. When my son was a toddler, he watched Toy Story again and again. And again. And again. My husband and I watched it so much that we would recite movie lines right along with Buzz and Woody. Buzz: You are a sad, strange little man, and you have my pity. Farewell. Woody: Oh, yeah? Well, good riddance, ya loony! We all know that sequels are rarely as good as the original, but Toy Story 2 was an exception. It was just as funny and just as clever as the first one. So, it was with great anticipation that my family waited for the release of Toy Story 3 on June 18th. We planned to see it on the release day. We settled in with our complimentary popcorn and drinks, 3D glasses on our faces. My kids were so excited. I was excited and my husband too. The whole theater was positively humming with excitement. All I can say is WOW. How could Toy Story 3 be as good as the first two? Our old favorite toys are there but the new toys – Big Baby, Lots-O’-Huggin’ Bear, and Ken – oh my gosh Ken! – are great new additions. I laughed. I cried. I never knew that I could care about toys so much. I won’t give away too much, but you can keep your expectations very high. And Toy Story 3 will surpass them. It’s that good. That’s right, my son won the Buzz Cup Tournament! He got the big trophy and bragging rights all night. We ended our exciting day with a delicious Toy Story-themed dinner, Toy Story gifts and a photo session with Lots-O’-Huggin’ Bear. I’m not going to say much, because I don’t want to spoil the movie for you, but *side eye* at Lots-O’-Huggin’ Bear. Hmmph! There you have it, straight from the toy’s mouth! If you haven’t seen the movie, go see it. You will love it; I promise. If you have seen the movie, tell me what you think! *Full Disclosure: I was invited by Disney to attend the Summer Nightastic media event. Disney paid for my flight, hotel room, several meals and park tickets for me and my family. I paid for my family’s travel. All opinions expressed are my own. Loved this! Such a cute idea. PS. Jayce loved it too! .-= Darcie – Such The Spot´s last blog ..The Real Edward =-. I loved your post on BAMWK that I had to come over here to become a fan. Love your writing! .-= Chocolate Mom´s last blog ..HAPPY FATHER’S DAY!! =-. It sounds like you all had a great time. I cannot wait to see Toy Story 3. I LOVE Woody! Hey, Sherrelle! It was great meeting you and your wonderful family. Here’s a pic of you and the army men. Fun times! Great meeting you and your family too Kate! 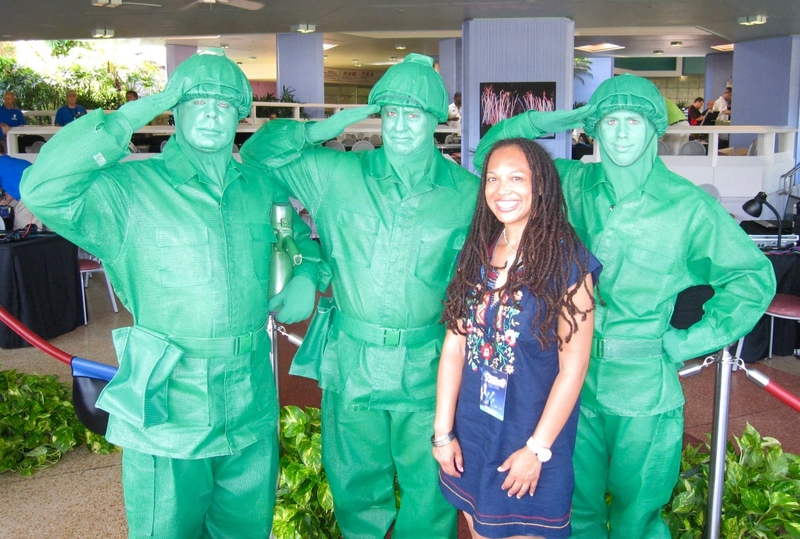 I didn’t know if that green came off or not in the heat, so I was standing close to the army men, but trying not to touch them…I think that you can tell in the photo LOL! Great write up, can,t wait to see it! I’ll have to remember that one. “Toys Grow Up”. My son has a hard time getting rid of the broken down ones so now I’ll remember that toys grow up too. Even if they are a little disabled.